Its high time to fill your wardrobe with pretty branded black dresses. Our regular blog readers might knew about Bhaap.com and about their awesome discount sales. 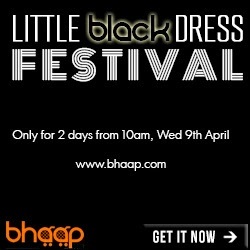 We have seen so many sales from Bhaap.com and this time they have a beautiful sales during 9th and 10th April starts at 10 AM. The sales name "Little Black dress" sales. Bhaap means steam and our mission in life is to bring the best Steaming Hot Daily Deals in online shopping India! Now, by steaming hot we don’t mean 10%, 20% or even 40% off; wBe rest assured, our products aren’t fake or low quality ‘made in China’ products. We source genuine stock of the highest quality from some of the world’s leading brands like Apple, Blackberry, Samsung, Adidas, Reebok, Puma, Christian Dior, Roberto Cavalli, Armani, Gucci, Guess, Maybelline, L’Oreal and MAC, just to name a few. As you can imagine, when deals are as steaming as hot ours, they will not last long. So you will need to get in quick before stocks run out! Although we will try to repeat some of our great deals, we cannot give any guarantees about bringing back popular deals. Don’t think that a deal you see today will come again. Snap it up because deals like ours will not come around on any other Indian online shopping website! Bhaap.com is not an online department store, nor do we aspire to be! We want to bring you great deals all day, every day. We will also do better than the usual 10-20% discount that other Indian online shopping sites offer – we think you deserve a lot better! That’s why we search the world over for the most popular brands at the best prices and bring the best of those online shopping deals straight to you. All this means great, steaming hot daily deals for you, your friends and family!